Usually when I see anything with the Dwayne ‘The Rock’ Johnson it immediately has my attention. But I have to admit, “Skyscraper” was never one of them. I just knew from the moment I saw the trailer that I wasn’t going to like this movie. It just seemed so generic and forgettable…and I was right. It’s basic, predictable and suffers due to that. 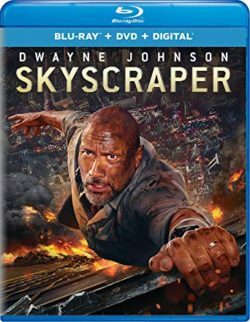 People who are looking for a Johnson puts up 110% and it shows but this movie is just a CGI filled lame action film that I will not remember in a few months. 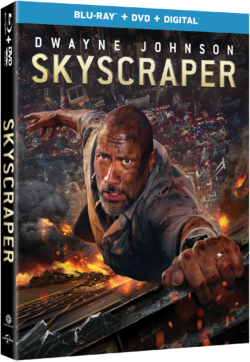 Official Premise: Fueled with adrenaline and high impact verticality,Skyscraperis led by superstar Dwayne Johnson who plays former FBIHostage Team leader, U.S. war veteranand amputeeWill Sawyer. While on assignment in Hong Kongas an assessor for security in skyscrapers, he comes to find the tallest and safest building in the world suddenly ablaze, and he has been framed for it. Wanted and on the run, Will must find those responsible, clear his nameand save his family who is trapped inside the building… above the fire line. 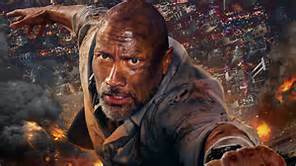 Outside of our megastar Dwayne Johnson, the film does have a solid supporting cast including Neve Campbell (“House of Cards”, “Scream” franchise), Chin Han (“The Dark Knight”), Roland Møller (“Land of Mine”), Pablo Schreiber (“American Gods”, “Orange is the New Black”) and Hannah Quinlivan (“Moon River”). The film will be available on 4K Ultra-HD combo pack which includess a 4K Ultra-HD Blu-ray + standard Blu-ray + Digital copy. I felt like the CGI showed through way too much in this film and it really had that sound stage feel…but the 4K transfer didn’t suffer. It is pretty solid for damn sure and it’s detailed beyond belief. I did a pause test and was blown away. They also didn’t cheap out on the soundtrack giving this film a rocking Dolby Atmos track as well as an Dolby TrueHD 7.1 track. Meh movie. Great A/V. The special features here aren’t anything too special at all but I got to give the director credit for being very hands on. There is a solid Feature Commentary track by Director Rawson Marshall Thurber as well as some deleted and extended scenes also with commentary. There is a quick behind the scenes featurette called “Dwayne Johnson: Embodying a Hero–Go” and it shows some character development for the lead star. “Inspiration” introduces us to the real life amputee and motivational speaker Jeff Glasbrenner, the inspiration for Dwayne Johnson’s role of Will Sawyer. There are a few other featurettes including focus on the women characters in “Opposing Forces” and the stunts in “Kids in Action”. Decent but not amazing.